The best I've never seen, thanks. This is, simply put, a work of art. 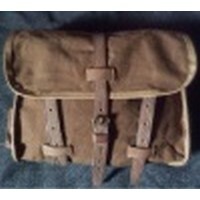 I also own the M1912 USMC Canteen Cover. Both are unique and rare glimpses at a time when a piece of fighting man's kit said a lot about pride. Each and every citizen and factory worker in the U.S. had pride in our country. I am talking about the poor people that finally made it out of Ellis Island, to work 18-hour days in poor ventillation, and dim light. They worked their fingers to the bone, just to put that eagle on those snaps. That eagle meant more to him or her than we will ever know. I was very pleased with the shipping time and the quality of the reproduction of the cover. I plan to use if for WW I re-enacting to replace the original that I was contemplating using (only joking). It looks like the real deal. Excellent reproduction of the First Pattern Cover to go with my first pattern Flat top canteen. Thank you! Super workmanship! excellent repro of a super rare item. Definitely field worthy. Great quality cover. I''m impressed with it although not sure why it lacks the US stamp on front? Yet another superb item. These are amazing and unlike the super rare originals now available to us all. Keep the eagle snap stuff coming please Jerry. A must have for your PE impression! The new ES early 1910 canteen cover is great. beautiful. Workmanship and materials are top notch. This is a fantastic reproduction and the ES are as close as you''re gonna get.